If you want a decadent dessert, this is the one for you! I ran across this recipe in one of the many food blogs that I read (I wish I could remember which one…if I find it again, i’ll add the link) and just had to make it. I first made it for myself and both Margie and I loved it. 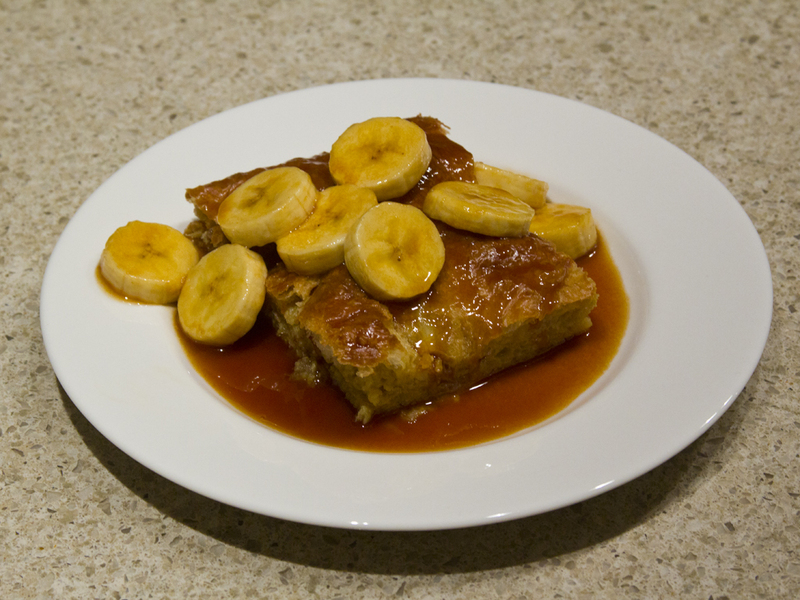 It was so good, that we had to share it and made the recipe again with my parents, who also loved it. The sauce can be very tricky getting the sugar to brown correctly, so don’t feel bad if it doesn’t turn out right the first time. It will take practice. preheat the oven to 350 degrees F. butter a 9″ x 13″ baking dish that’s at least 2″ tall. place the mini croissants in the prepared baking dish, making sure they fit in snugly. you don’t want there to be large gaps or too much room between the croissants, so you can tear a few up to fill some of the holes if you need to. set aside. in a medium saucepan, combine the light brown sugar, dark brown sugar and water. place over medium-high heat, and stir frequently with a whisk or wooden spoon. while the sugars are cooking on the stove, combine the heavy cream and half & half in a large microwave-safe bowl. microwave in 30 second increments, stirring between each heating until the liquid is warm. add the dark rum and banana liqueur to the warmed cream mixture, and stir to combine. set aside. in a medium bowl, combine the beaten eggs, salt and vanilla bean paste. whisk to combine, and set aside. when the brown sugars are dissolved in the water, and the mixture begins to boil, remove the pan from the heat. while whisking constantly, slowly pour in the heated cream mixture. 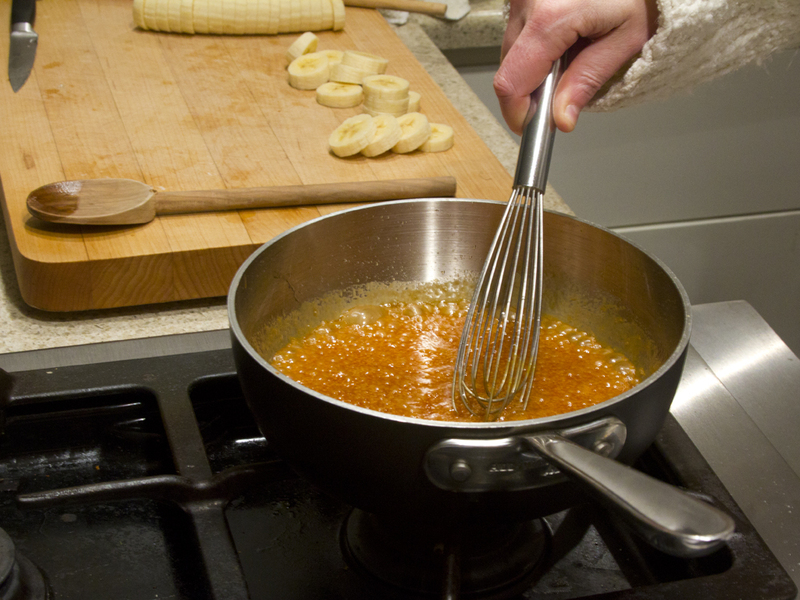 the saucepan will likely bubble and hiss violently, but just continue whisking feverishly and adding the cream until the mixture is smooth and uniform. very slowly pour the hot liquid from the saucepan into the bowl containing the beaten egg mixture, whisking constantly to avoid scrambling the eggs. when the custard is smooth and uniform, pour immediately over the croissants in the baking dish. the croissants will want to float to the top, but press them down to ensure that the tops are soaked through. carefully transfer the baking dish to the middle rack of the oven. 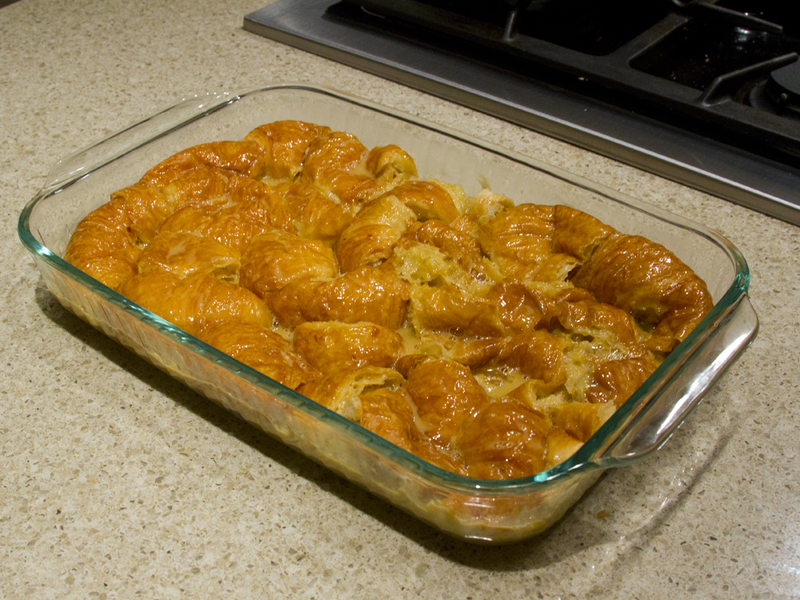 bake the croissant bread pudding at 350 degrees F for 30-35 minutes, or until the tops of the croissants are burnished and brown, and the custard is baked and no longer liquidy. 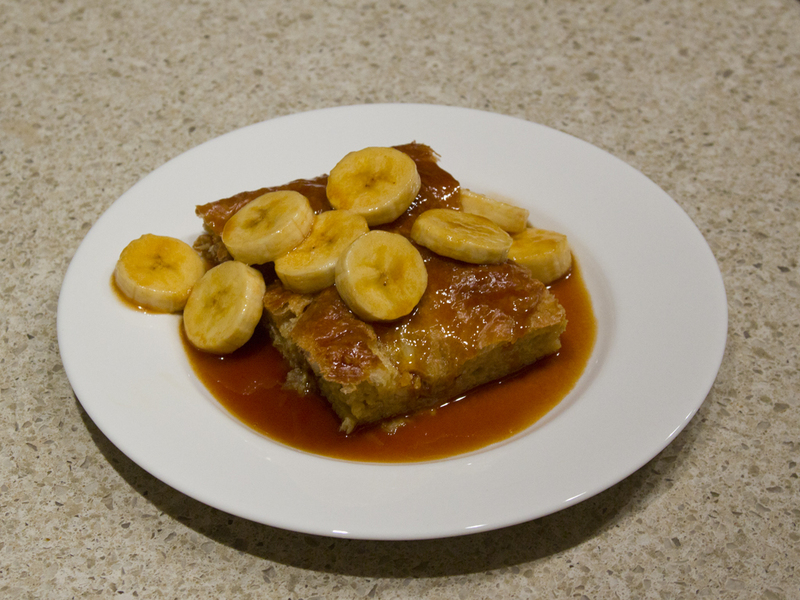 you can serve this immediately with the bananas foster sauce, or if preparing in advance, allow to cool completely at room temperature. cover the cooled baking dish with aluminum foil, and transfer to the fridge. 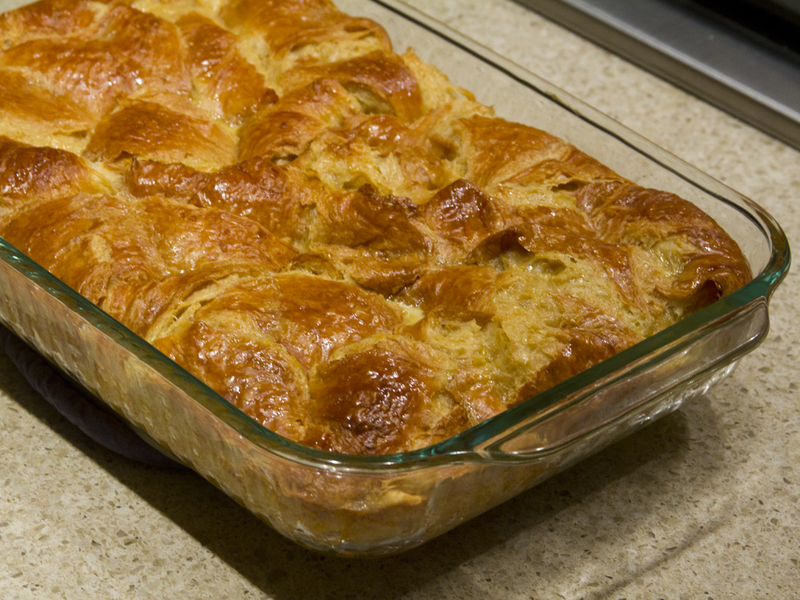 the croissant bread pudding can be prepared up to 3 days ahead of serving time. to reheat, simply uncover the baking dish and place in a 350 degree F oven for about 15-20 minutes, until heated through. serve immediately. in a heavy-bottomed saucepan with high sides, combine the granulated sugar and water. place the saucepan over medium-high heat, and allow the sugar to melt and dissolve, stirring occasionally with a wooden spoon. the sugar will begin to turn a light amber color once it’s melted and continues to cook. when the sugar is a light brown color, add the cold cubes of butter, whisking constantly. the sugar will bubble and sizzle violently, but continue whisking until the butter is melted and the sauce is smooth. remove the saucepan from the heat, and add the heavy cream. again, the sauce will bubble up and hiss, but just whisk the sauce until it is smooth and the heavy cream is incorporated. add the dark rum, banana liqueur, vanilla extract and salt. whisk to combine. 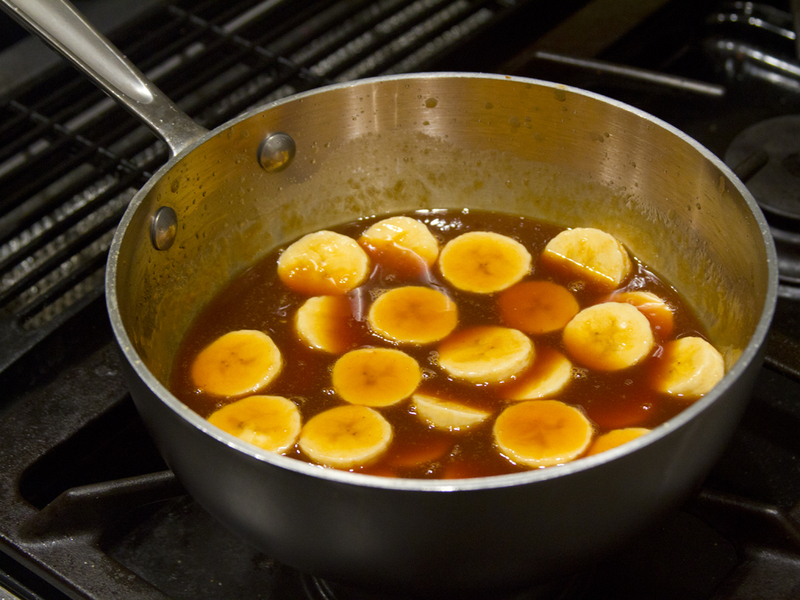 switch to a silicone spatula, and add the banana coins, folding them into the caramel sauce to ensure they’re coated with sauce. pour the sauce immediately over slices of warm croissant bread pudding. Mmmm, mmmm. Time to dig in! Restaurant Review – Le Pigeon Portland, OR. Last week, Margie and I made a reservation to go to one of our most favorite restaurants in Portland; Le Pigeon. Chef Gabe Rucker has created a uniquely Portland restaurant, with it’s small dining area, open kitchen, reservations made long in advance, communal table, mismatched tableware, and amazing good, simple food. I have had the pleasure of eating here five or six times over the years and can honestly say I have never had anything I did not like. I don’t know of many restaurants I can say that about. On this particular night, we got a seat at the counter overlooking the open kitchen. This is a great spot to sit and just watch all the work that goes into each creation. Every order is made to order, one at a time with at least three people checking it over before it goes to the table. The attention to detail is something to behold. If you get seated at one of the longer communal tables, I think you will find it a fun experience eating next to strangers. You never know what you might over hear and you might even make some new friends by the end of the night. We stared at the small menu for about 10 minutes, not being able to decide just what to have. I found at least three entrees that I really wanted that night, but between the two of us, we had to formulate our plan to order the top two we liked best. Once we had the entrée portion figured out, we had to find an hors d’oeuvres to try as well. We chose the Gnocchi with Pheasant, Pears and Parsnips, as gnocchi is a favorite of both of us. After a short while, the beautifully plated gnocchi was presented in front of us. It smelled amazing. There was a nice earthy aroma that came from it and we dug in. The mix of the creamy gnocchi with the pulled pheasant meat was delicious and the pear and parsnip added a nice contrast of taste and texture. If this dish is on the menu, it is a must have. I usually end up ordering the classic Rucker inspired Beef Cheek Bourguignon, but tonight I promised I would try something new. Before moving along to what we actually ordered, I thought this dish deserved a little praise. The Bourguignon is a dish I have had here a couple of times before and it is just hard not to love this dish. It is a wonderful take on a classic French dish that has the pieces of beef cheek melting in your mouth. There is a good smoky richness to the meat and vegetables that just feels so comforting. It’s awesome. There’s no denying it. On this particular night the Beef Duo had called my name. The pairing of a Rib Eye and a Short Rib with Celery Root and Hedgehog Mushrooms was too much to pass over. The dish came out and I was surprised at the immensity of the portion. Exactly what I like to see with a good cut of meat! The mushroom sauce was very earthy and rich and suited the beef very well. Margie asked me what I thought of it and all I could say was “this is one beefy sauce!” It’s complexity and depth of flavor really enhanced the cuts of meat and were a perfect fit for a rainy Portland winter night. Margie decided on a very interesting dish for her entrée; one that I was eyeing as well. The Chicken with Spätzle, Truffle, and Turnips was also delicious as we both heartily approved. The dis had a nice rustic flavor and was beautifully plated as are nearly every dish they serve. The chicken was perfectly cooked and very moist. Spätzle is a fun little accompaniment that you don’t see often. I have had it a couple of times and it is a nice change of pace for a starch component to a dish. We managed to get persuaded to try dessert and settled on a Smoked Almond Cake with S’mores, Huckleberry, and Chocolate Mousse. It was a very tasty dessert to finish the meal with and was just right as I finished up my glass of Oregon Pinot Noir. This is easily one of the best restaurants in Portland, in my opinion and is one you should definitely try if you are ever in town. If you do live in Portland and haven’t been here, you are really missing out. The food is beautifully superb. The atmosphere is bustling and unique. It’s truly a great culinary experience.